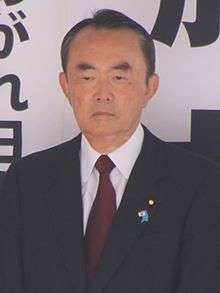 The 47th general election of members of the House of Representatives (第47回衆議院議員総選挙, dai-yonjūnanakai Shūgiin giin sōsenkyo) of Japan was held on 14 December 2014. Voting took place in all Representatives constituencies of Japan including proportional blocks, in order to appoint Members of Diet to seats in the House of Representatives, the lower house of the National Diet of Japan. As the cabinet resigns in the first post-election Diet session after a general House of Representatives election (Constitution, Article 70), the lower house election also led to a new designation election of the prime minister in the Diet (Shinzo Abe was reappointed), and the appointment of a new cabinet (with some ministers re-appointed). In 2012, the Democratic Party of Japan government under Yoshihiko Noda decided to implement a raise of the Japanese consumption tax. 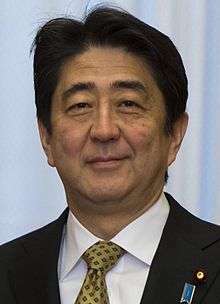 Following this move, the Liberal Democratic Party under Shinzo Abe regained control of the Japanese government in the December 2012 general election. Abe proceeded to implement a series of economic programs known as "Abenomics" in a bid to stimulate the economy. Despite these programs, Japan entered a technical recession in mid-2014, which Abe blamed on the consumption tax hike, even though many members of the LDP supported the hike. Abe called a snap election on November 18, in part for the purpose of winning LDP backing to postpone the hike and pursue the Abenomics package. 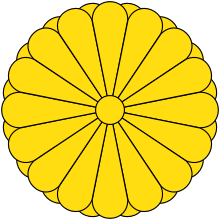 ↑ Wakatabe, Masazumi. "Election With A Cause: Why Japan's Prime Minister Shinzo Abe Must Call General Election Now". Retrieved 2016-07-14. ↑ McCurry, Justin (2014-11-18). "Japan calls snap election". the Guardian. Retrieved 2016-07-14. ↑ Boyd, John. "Japan's unwanted election: Why now?". www.aljazeera.com. Retrieved 2016-07-14. 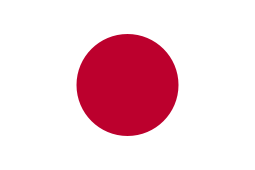 ↑ "Abe coalition secures big Japan election win with record low turnout". Reuters. 2014-12-15. Retrieved 2016-07-14. ↑ "Japan election: Voters back Shinzo Abe as PM wins new term - BBC News". Retrieved 2016-07-14. ↑ "Romping home". The Economist. ISSN 0013-0613. Retrieved 2016-07-14. ↑ NHK(Japan Broadcasting Corporation). "NHK2014衆院選". NHK2014衆院選. 1 2 "Abe tightens grip on power as ruling coalition wins 325 seats in Lower House election". The Japan Times. 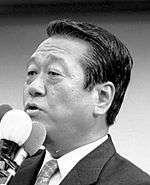 ↑ "Ex-Your Party leader Watanabe, ex-Tokyo Gov. Ishihara to lose seats". mainichi.jp. ↑ "Approval rating for Abe Cabinet falls below 50% for 1st time since inauguration: Mainichi poll (in English)". Mainichi Shimbun. 24 December 2013. Retrieved 5 January 2014.